This sensor, as we will see in the following paragraphs, is a small “jewel” of micro-electronic technology, although its cost is really low. The use that we want to do is not linked to “laser-ranging” applications but rather we want to exploit its ability to measure the time-of-flight of light pulses in order to make speed of light measurements in different situations. Time of flight (TOF) is a property of an object, particle or acoustic, electromagnetic or other wave. It is the time that such an object needs to travel a distance through a medium. The measurement of this time (i.e. the time of flight) can be used for a time standard, as a way to measure velocity or path length through a given medium, or as a way to learn about the particle or medium (such as composition or flow rate). In the TOF technique, there must be an emitter and a receiver. 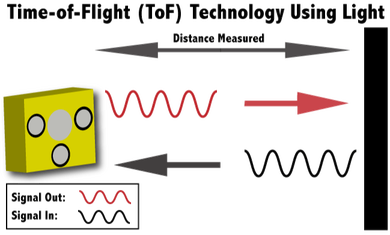 The VL53L0X sensor incorporates both: the emitter consists of a VCSEL laser that emits pulses at 940 nm (near infrared), while the receiver is an ultra-fast SPAD diode that is sensitive to a single photon and adequately shielded so as to receive only the wavelength at 940 nm of the VCSEL laser. Both are very advanced devices. 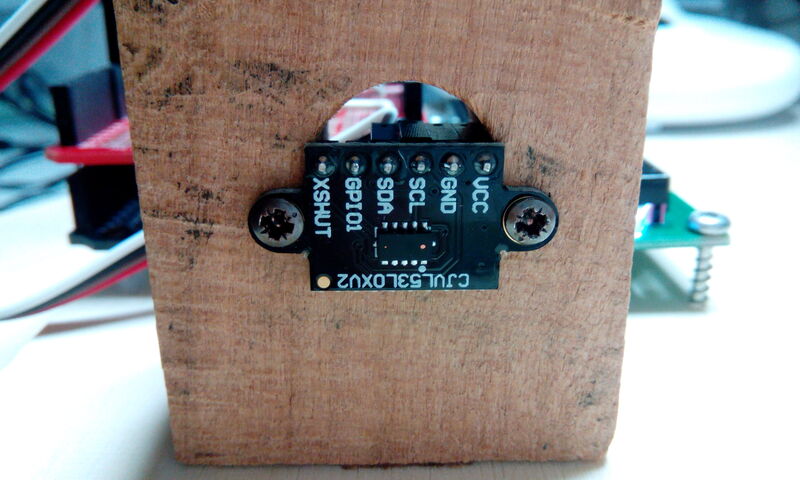 The image below shows the VL53L0X sensor with highlighted emitter and receiver. 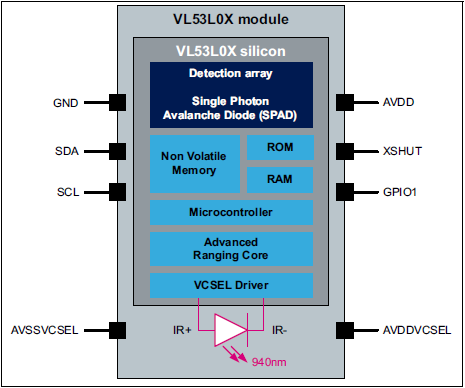 The VL53L0X sensor is very advanced and integrates inside the VCSEL laser driver, the reading of the SPAD diode detector and the whole management of the device, including calibration, measurement and data conversion for the I2C interface. The image below shows the block diagram of the sensor. 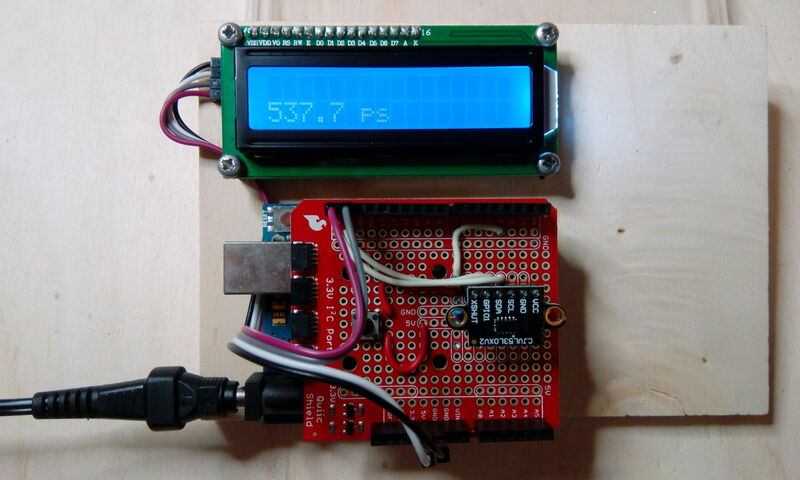 The VL53L0X sensor is designed for a power supply voltage of 3.3 V, and also the I2C, SDA and SCL interface lines require logic levels of 3.3 V. To facilitate the interface with an external microcontroller such as Arduino is convenient to adopt a breakout board that provides the conversion from 5 V to 3.3 V and performs the level translation on the SDA and SCL lines and provides the necessary pull-up resistors for the I2C interface. 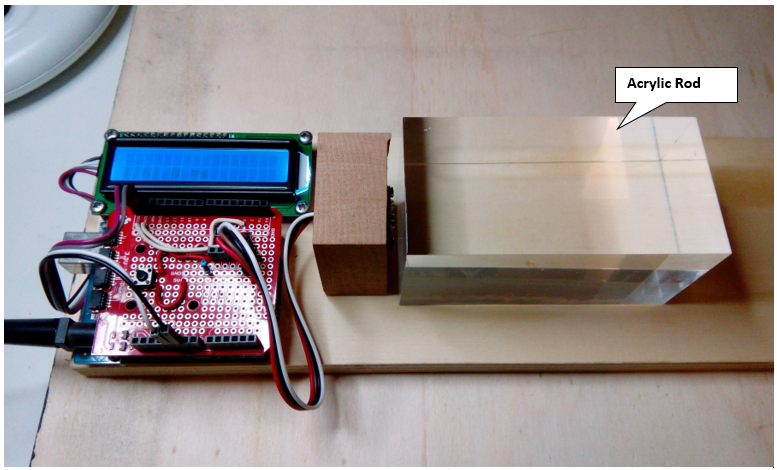 The images below show the sensor mounted on a wooden frame and connected to Arduino through a shield; an 16×2 I2C display is also connected to Arduino for displaying the flight time. The trigger to the measurement process takes place with a button located on the shield. The diagram of the circuit connections and the software part can be found at this link: Jabolatorium , from which we took inspiration for the realization of this project. 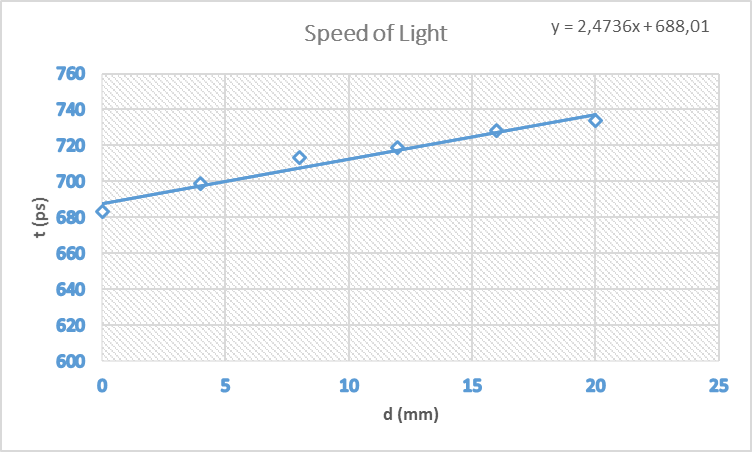 For the measurement of the speed of light in air we used our sensor by doing several measurements at different distances, in order to obtain more data and therefore have a statistically more significant result. We made two series of measures: one varying the distance only a few millimeters (using the micrometer shown in the image below) and the other varying the distance in steps of 10 cm. 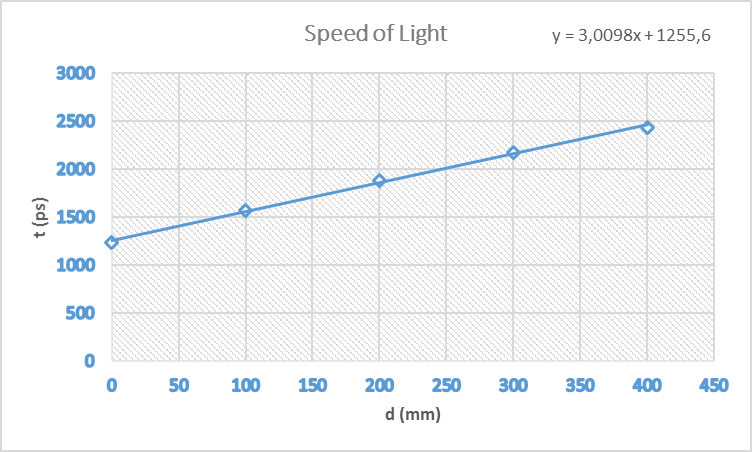 The results are shown in the graphs below, in which the equation of the regression line is also reported, whose proportionality constant corresponds to the speed of light. The measurement with the variation of only a few millimeters is, as expected, rather imprecise, while the measurement on centimeter variations gives us a value of 3.0098 mm/ps against the correct value of 2.9970 mm/ps, with an error percentage of only 0.4%. Where c0 is the speed of light in vacuum, ε0 is the vacuum electrical permittivity and μ0 is the vacuum magnetic permeability. Passing through the materials the light undergoes optical dispersion and, in many cases of interest, it propagates with a speed lower than c0, of a factor n called the refractive index of the material. The speed of light in the air is only slightly lower than c0. Thicker materials, such as water and glass, slow down light to fractions of 3/4 and 2/3 c0. We made two types of measures: in one case we used a plastic tray to hold the liquids under test, in the other case we used solid blocks of transparent material. For liquids we used water and paraffin oil, while for solids we tested an acrylic plastic rod. 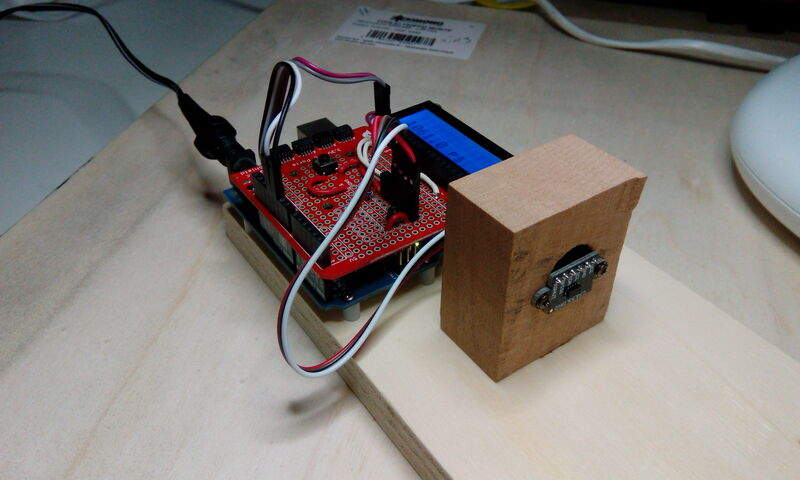 The tank and the solid block should be positioned almost in contact with the sensor: it is necessary to do some tests to verify the optimal position in order to avoid spurious reflections coming from the first surface. 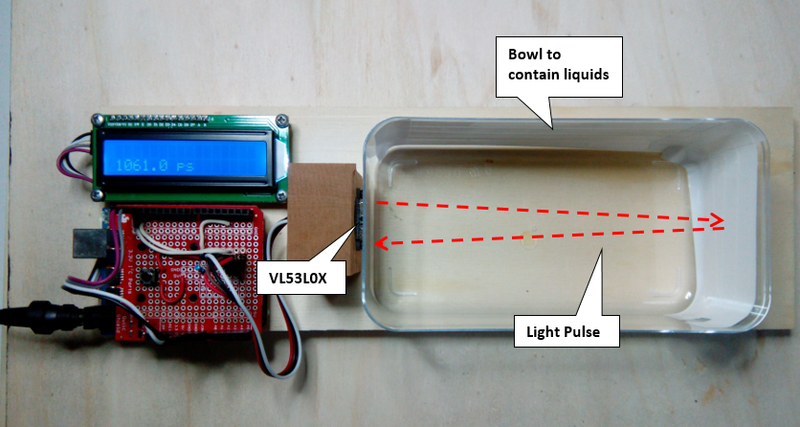 The images below show the experimental setup. The table below shows the data obtained from the measurements, in particular we also report the refractive index of the material calculated as the ratio between the flight time in the material and the flight time in the air. Recall that the index of refraction, n, of a material is the ratio between the speed of light in the material and the speed of light in the vacuum: n = v / c, knowing that the speed of light in the air is almost equal to that in the vacuum, the index of refraction can be calculated as the ratio between flight times. From the data obtained we can see how the agreement is good enough even if not perfect, however in line with the type of experimental setup. 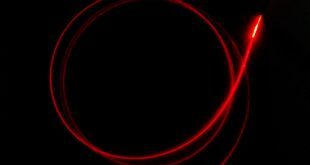 With this method, however, rapid experimental evidence is obtained of how the speed of light is not constant but strongly depends on the material passed through.